It was quite incredible to be in Singapore, and then Australia, as the European referendum results came in overnight. It was fascinating to watch the reactions especially in the international media and the Australian press. But what was even more bizarre was the hysteria from some people in the United Kingdom. I have never seen anything like it. It seems to me to be a combination of Generation Snowflake, social media and the increasingly dumbed down nature of modern British society. This is a bit strong but I thought the wee video clips within it are indicative, amusing and sad… imagine a 22-year-old crying because she thought that the EU vote meant that Nandos, a South African food chain would close! It’s the Fault of the Old – There was serious discussion about whether older people should actually have a vote, or whether their vote should be diminished. Even the Sydney Morning Herald carried a piece with this kind of nonsense. It’s Only Advisory – And then the liberal elitist broadsheets in the UK started saying things like the referendum was only advisory. This piece of information that they had strangely forgotten to pass on before the result was announced was put forward as some kind of sage and obvious wisdom. Prospect magazine, which up until about six months ago was one of my favourite magazines, but has descended into a caricature of liberal antireligious elitism, even went so far as to suggest that we need another referendum before article 50 was invoked, and doubtless more referendums after that once negotiations had been conducted. In other words, in good EU fashion, we have to keep on having referendums until we get the right result! It’s the end of the UK – The vote meant the breakup of the United Kingdom because Scotland, according to one SNP politician, had spoken with one voice and it was our democratic right to remain in the EU. Whilst Nicola Sturgeon has done an admirable job in stirring things up, and in seemingly being the only politician with a coherent thought out response, the media seem to be missing out on the most obvious facts. Scotland did not speak with one voice. 62% of the population who voted, voted to remain in the EU. Yet 38% voted to leave. Despite all the political parties, all the political leaders, and virtually the entire Scottish media, political and educational establishment speaking with one voice. Furthermore whilst 1.6 million people voted to remain, 1.1 million voted to leave, and 1.3 million abstain by not voting at all. It is hardly a ringing endorsement. It is also a simple fact that there cannot be another Scottish referendum unless the Westminster government should agree it – and there is not a chance of that happening. So whilst the chattering classes in Scotland talk about it as though it is some kind of inevitable event, in reality it is just not going to happen. Regrexit – And then there was the wonderful phenomenon of Regrexit. Word was soon put round that many people had not realised what they were doing and that now they were regretting their vote to leave. Videos were posted of a handful of the 17 million people who voted leave saying they wish they hadn’t. Unfortunately facts again got in the way of this propaganda. 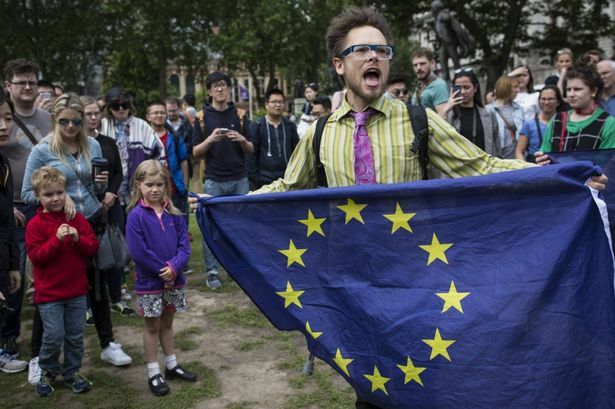 An Ipos Mori poll found that whilst there were 3% of those who voted leave who regretted their vote, 4% of those who voted remain regretted theirs! What about all the other warnings that we received? World War three has not broken out, civil society has not broken down, fascists have not taken over the government, and England have not been knocked out of the Euros by a country the size of Aberdeen! Okay only one of those is false. There was immediately after the referendum a disturbing spike in the number of hate crimes – as one ‘intelligent’ commentator put it – “if you vote from Hitler you are responsible for Reichskristallnacht, if you vote for Brexit you carry that responsibility and those who deny that, only delude themselves”. Apart from the obvious faulty logic and extreme correlation, again the facts get in the way of this particular piece of propaganda. After any major national event is a sad fact that reported hate crimes go up. Furthermore it is difficult to know what the actual situation is. Why? Because the figures only put forward the number of reported hate crimes (up 58%). It does not mean that the police have investigated or that there is any case to answer. The law in Britain is that if you burgle my house or attack me, and I report it as a hate crime, or indeed report anything that you say as a hate crime, the police have to record it as such. Having said that I have no doubt at all that there are those who take the opportunity of events like this to express their racism and their spite. It is totally disgusting and they should be dealt with by the full force of the law. And what about the collapsing economy? Well it was a bit rough being in Australia as the pound lost 15% of its value – I guess I lost out on a couple of Flat Whites! And some of my friends were very quick to post the following day about the billions of pounds being wiped off the stock market. But again the facts get in the way. The stock market is now at its highest for over a year, today it was announced that GDP had increased in the past three months by 0.6%, up 2.6% on the same period last year; the American bank Wells Fargo announced that they were going to spend £300 million on a new European headquarters in London and even the decline in the pound had a silver lining, especially for those in the manufacturing industry in Britain who export their goods. The results had hardly been announced before Australia, New Zealand and 10 other countries indicated that they were looking immediately for new trade deals with Britain. I think my favourite story in all of this is a local one. GlaxoSmithKline announced they are spending £110 million on a new investment at their Montrose site. What is fascinating about this is that their chief executive before the referendum stated Brexit would be a financial disaster and greatly harm his company. And yet immediately after Brexit they decide to invest into major new facilities in the United Kingdom! Of course there are undoubtedly major difficulties ahead. There will be losers as there will be winners in this new scenario. But the point is that the world has not collapsed, business goes on and in fact it seems as though there is a new world of opportunities for the United Kingdom. I am very proud of the United Kingdom. I had thought it was finished, and whilst I would still prefer Scotland to be an independent nation I would much rather belong to Scotland within the United Kingdom outwith the EU, than a Scotland outwith the United Kingdom, and in thrall to the EU commission. To those who say voting changes nothing, we now know that it is possible to have a political revolution without violence, anarchy and breakdown. I am proud to belong to a political system that permits this (the one caveat being that the result of the referendum is actually honoured).I think that one of the major dangers is that the establishment within the UK, which has a whole, was vastly in favour of the EU, will behave like the EU, and sidetrack and ignore the referendum. If they do so it would be profoundly serious because it would mean in effect the end of British democracy. But maybe I’m being too cynical? We shall see. Let me add one thought as a Christian. And it comes back to the hysteria mentioned at the beginning of this article. When we replace religion (God) with politics, or start treating politics as some kind of religion, we are going to end up with this kind of hysteria. It is profoundly dangerous. The Christian especially must have a much wider perspective. At the end of the day neither remain nor leave are going to solve any of our problems. If we had voted, as I expected, remain, I would have been disappointed, but it would not have been the end of the world. Christians need to reflect upon these things, pray for those in authority (of whatever political opinion) and plead with the Lord to send renewal and revival of his cause in our land. If that does not happen, choosing which sinking ship to be on, makes no real difference. On the plane back from Australia I watched the wonderful film of Hank Williams life, I Saw the Light. I’ll probably write a review of it later, but me while I leave you with this clip that somehow seems appropriate! Brexit for Australia – And Others! I’ve appreciated reading your Brexit-related posts, and often found them helpful. Fairly precient, as it turns out! Anyway, this may be a matter of perception, but I don’t think the “it’s only advisory” line was an after-thought … although, to be fair, how to use that particular factoid may well have morphed. Thanks David, that’s fair enough. I have not read that in the Guardian, nor had I seen it in any other newspaper or magazine. the government told us in the document it sent to every household ” this is your decision. The government will implement what you decide”. Nobody voted having been told, or thinking that they were just giving the government advice! If people start saying after the referendum, because they have lost, that it is only advisory, that is a despicable betrayal of democracy. In fact, if the government were to act like the EU, and ignore the referendum, or twist it into something else, then in my view that will be more serious than either staying in, or leaving, the EU. It will mean the end of British democracy as we know it and we will have turned into an autocracy with politicians and political parties feeling free to do whatever they please as long as they have the backing of big business and the educational establishment. Neitzche put it in his context at the period of the enlightenment and optimism in human endeavour as God being dead and we have killed him. The what will now happen for us the murderers of murderers? Must we not all become “gods”. Then spent the rest of his life trying to fill what he perceived as a void being left with an absence of God. His jottings about a “will to power”, of human greatness consistent with the enlightenment was taken by his sister, a Nazi supporter, published and used as Nazi propaganda. Would it be a surprise if a decline in Christianity in the west similarly gave rise to right wing fascism again? Hell on earth indeed. However there is hope. The violence inherent within humanity with God withdrawing and leaving humanity to go it’s own way epitomised by the violence endured by Christ and his promise of life in the fullest now and in eternity. It’s years since I read the Grauniad, but in the lead-up to the referendum I can not recall, seeing or hearing ANY mention of it being only advisory. But in the immediate aftermath , there was Lammy, and Kenneth Clarke (in parliament)) dismissing it as a plebicite. That rankled with me- the high-handedness of the pronouncements. Lammmy and Clarke on the same side, despite their party differences – a liberation indeed. I’ll repeat what I said elsewhere in David’s blog. Where does parliament get its sovereignty from – the people? So now we’d get the political classes, voting against those who voted them into power. This is from the recesses of my student days, but isn’t the referendum akin to the operation of the “rule of law.”? Perhaps the an example of operation of Dicey’s “blue eyed babies” in reverse. But now it seems that rarely a day goes by without negative spin and unbalanced speculation passing as “news” attributing Bretix as the sole source of all that is bad in society and the economy. And as for the sovereignty of parliament in the UK, it is balance d by “separation of powers” between the legislature (the Commons and Lords), the Executive (cabinet) and Independent judiciary. This has been so wonderfully demonstrated, even today, with the Supreme Court judging the Scottish named person scheme UNLAWFUL after judicial review. Isn’t it mavellous to live in a democracy. Wither the EU. PS Thanks to the Christian Institutes website for the quotation from the Supreme Court’s judgment. Should have credited it in the first place. That comes from RAIL Magazine, Issue 805 (July 20 – August 2nd 2016). It was written by Christian Woolmar, a noted commentator on the railways. In 2012 he sought to be selected as Labour candidate to be the mayor of London. Strangely, I don’t recall any mention during the referendum campaign of it only being advisory. But then the metropolitan elite’s purpose is obviously to protect us from the consequences of our own decisions. For our own good they are there to put things right when we get them wrong. What will the next step be? Suggesting that we have a second election when we dare to elect the ‘wrong’ government. On the basis, no doubt, that the wrong party won because of ‘false claims’ and many people now regretted voting for that party. After all, an election is only a snapshot of opinion on a particular date. So who needs to pay any attention to what the people decided?